Because I am innately conservative by nature, I am often hesitant to try new things until I see that other people that I know have tried them and I can see that they are beneficial to them. This is especially true with anything regarding the blogosphere. I know what has worked for me in the past, and I am hesitant to change it. "Word is a ... mail piece has gone out exposing Byrge's multiple separate drug arrests," Campfield wrote on the blog. "Including arrests for possession and drug dealing. (I hear the mug shots are gold)." For those in need of a translation, when Stacey says "word is," it means "I have heard this from a source and until it happens, this is secondhand or unofficial information." The post in question was about a mailer that was apparently never sent out. Had the rumored mailer been sent out and the charges were in fact false and could be proven so, then Mr. Byrge would have serious grounds for a libel suit. Because the mailer was not sent out and the charges therein were never forced to be proven false, Stacey Campfield's post falls under the category of rumor about a public figure, and that means that Roger Byrge doesn't have grounds to sue Rocky and Bullwinkle if he wanted to, and this case will be laughed out of court. Why is that? Because the standards of libel for anyone considered a public figure are quite different than for those not in public life per a 1964 Supreme Court case, New York Times v. Sullivan. In Sullivan the Supreme Court held that a person or media outlet (we must assume that Byrge alleges that Campfield in his capacity as a blogger is a media outlet-so much for the theory that bloggers are ignoramuses in pajamas who live with their parents-thank you, Roger Byrge) must be acting with actual malice. In later cases, the Supreme Court and lower courts have set this actual malice standard to mean that damages cannot be awarded to public figures for inflicting "emotional distress" upon them (see Hustler Magazine v. Falwell). Further, Campfield has the legal privilege to express opinion on his blog and to cite information which he heard secondhand or even thirdhand without fear of libel since Campfield was not attempting to say that the allegations are true, just that he heard about them and that they would be in a coming mailer, and that he heard that "the mug shots are gold." Since Roger Byrge is a public figure, Campfield repeating secondhand information on his blog does not constitute meeting an actual malice standard since Campfield did not attempt to give false evidence as to the validity of the rumors in question per Milkovich v. Lorain Journal. The sad part of all of this really is that Roger Byrge is being taken advantage of. His attorney or attorneys know that he has no legal claim for libel, but they will gladly take his money. All 50 Republicans in the House have signed pledges to back a Republican speaker and speaker pro tem. Despite the apparent rock-solid support of the GOP, the Covington Democrat said "there's a lot of time between now and January 13," when the House will convene and elect its speaker. "I am trying to get the votes right now. Every day I'm trying," he said. At one point during the budget briefing, about a half-dozen lawmakers, including Naifeh, Minority Leader Jason Mumpower, and Lt. Gov. Ron Ramsey, were clustered in a back hallway behind the hearing room. Heads together, Mumpower, Naifeh and House Republican Charles Sargent spoke in low tones as cigarette smoke drifted in through an open outside door propped open so Sargent could smoke as they talked. Jimmy Naifeh is right about one thing, and that is that there is plenty of time between now and January 13th for him to cobble together an arrangement to remain Speaker. He only needs one vote, and it should be remembered that the "Republicans" who have supported him in the past have already demonstrated that they have no loyalty to their own caucus. Hence, why should these people be trusted to keep their word if they have already demonstrated to the party that they are disloyal in the extreme? There is also a real possibility that Jason Mumpower may be going about this the wrong way. Recall that the rules in both the Tennessee House of Representatives and the Senate state that if no candidate receives a majority of the votes for Speaker, the previous Speaker remains in control. The pledge that Mumpower caused all House Republicans to sign said "we pledge to support a Republican for Speaker." Nowhere did this document say which Republican they were pledging to support. A backhanded way for the Naifeh Republicans to insure that Boss Hogg remains Speaker of the House is to cast their votes for a third person, something the rules do allow-and it would only take one such vote to return the House to the control of Jimmy Naifeh's iron hand. All the while the member or members who engaged in such devious behavior could say "I kept my word and voted for a Republican for Speaker." The Republican majority that the people of this State elected on November 4th will not be secure until there is a Republican in command of the House of Representatives. Rest assured that Jimmy Naifeh and his minions have no regard for such a small thing as the results of an election. The hypocrisy in all of this is that if the situation were reversed, the Democrats would be beating the door down to get into the Speaker's office in the Plaza. It is in a circumstance like this where Jason Mumpower's worth and ability as a leader is going to be tested. If the truth were told, it was probably Naifeh's Republican supporters who gave Mumpower the votes that he needed to defeat Bill Dunn in the Leadership vote two years ago, because Jimmy Naifeh despises Dunn and Dunn's removal was likely viewed by Naifeh as beneficial to him at the time. Nonetheless, from the day Mumpower assumed the roll of Republican Leader he spoke of gaining a majority in the House. He made the case to many in the grassroots who had supported his opponent for Leader that his sole goal was to gain a majority in the House and to assume the Speaker's gavel. He was our man, he said, and we could trust that he would fight the power. Now, the majority that Mumpower was proclaiming would change the face of the General Assembly has been achieved. Jason Mumpower is on the cusp of becoming Speaker of the House, and if he does so, his position as Leader will be impregnable for as long as the GOP remains in control. If Mumpower fails to keep his men and women together after promising that he had the votes to be elected Speaker, then it brings into question whether this is Mumpower's majority, or whether the majority was achieved by the hard work of a lot of other people who will never get the credit-and who still will not see a Republican Speaker. This is do-or-die time for Mumpower. It isn't just the Speaker's chair that will be on the line January 13th, but Jason Mumpower's reputation. I want to see Jason Mumpower with that gavel. If he is not, all of the effort placed into getting a majority will be nothing but a waste. 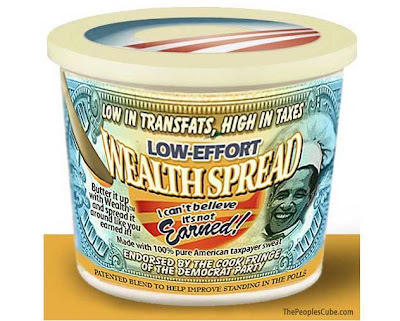 Spread that wealth around, it is good on anything! “We wanted a visual testament to the fact that indeed, our Republicans are united,” he said. Leadership had us all come up to sign a pledge that we would vote for a Republican. All 50 of us signed. Several more conservative Democrats are supposedly calling to join the team in the expectation that a more fair hearing will be now given on important issues. If a slew of Democrats, even those of the most conservative variety, jump ship and votes Republican for Speaker of the House, it would be poetic justice for all of those years that Jimmy Naifeh cajoled Republicans into voting for him. If all 50 Republicans actually keep their pledge, we can rightly call Jason Mumpower the Speaker-designate. I will only feel secure when the roll is called on January 13th. While Republicans and conservatives everywhere should be rightly ecstatic at the prospect of a Republican Speaker, our new Speaker-designate should be given a word of caution: While it is to be expected that negotiation and bargaining were and are necessary to insure that the Naifeh Republicans come home and vote right at roll call-including offering these folks some very choice committee posts, I'm sure-the new Speaker should not sell the store at the price of leaving the true believers from the grassroots on the backbenches. Many good conservative Republicans battled the establishment in the trenches for years, believing that someday all of their seemingly endless fighting would pay off. These are the people who have given you your majority, Mr. Speaker, whether you realize that or not. Please do not throw them the table scraps. Frank Niceley needs to be back on the Agriculture Committee, and placed in a position of authority so that Democrats must answer to him, and they can feel firsthand what it is like to have their bills killed and then ressurrected as the original thought of the majority. It is because of your predecessor Bill Dunn that you are in this position, Mr. Speaker. In a year when Republicans were supposed to lose seats, Bill Dunn held the fort in what even seasoned political veterans thought was a miracle. Bill Dunn has spent years fighting Jimmy Naifeh and standing up for justice for the infirmed, the aged, and the helpless unborn. Remember those who came before you and who got all of us as Republicans to this point. You may think Stacey Campfield is crazy, but a whole lot of people love Stacey, and with good reason-Stacey Campfield is the most responsive member of the House, and is the one people are most likely to say they have had a positive interaction with. Rather than be treated like dirt after the manner that the Democrats treated him, Stacey's bills deserve a fair hearing-give him some serious committee assignments that reflect issues that he cares about, and with those assignments he can now set about doing good. Continue to be as accessable to the grassroots of the party as Speaker as you were as Minority Leader. Let us hear from you as often as possible. Republicans have the potential to change the very way business is done at the Plaza. Speaker Jason Mumpower can lead the way. 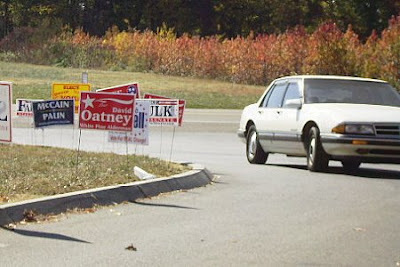 Nearly all of the local candidates had signs out along the drive to the polling place. In this case, it was White Pine Elementary School. 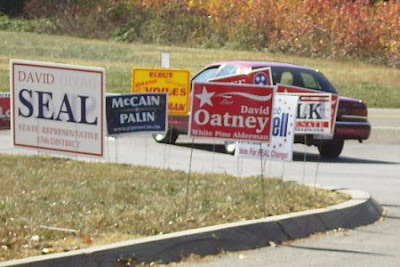 For most of the day there was a steady stream of people coming to exercise their franchise. These signs were along Roy Messer Highway at the entrance to the school. 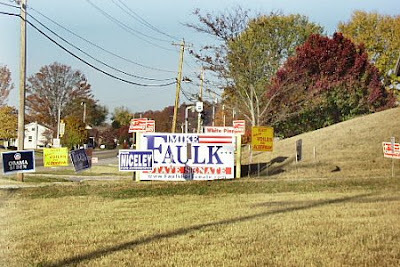 Whoever put up the massive Mike Faulk sign was kind enough to make sure the signs that Nicole and myself had put down Monday night were still there-on top of Mike's sign. 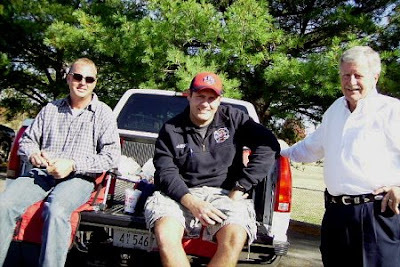 Pictured are two of my opponents: Eventual Alderman-Elect Curt Evans (left), and Josh Sinard (center). On the right is White Pine Mayor Stanley Wilder, who worked the polls and asked for votes despite running for re-election without opposition. 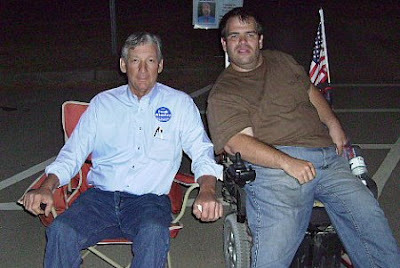 Our State Representative Frank Niceley also worked the polls in White Pine on November 4th, and joined me for a bit. That's Frank on the left and me on the right. Frank was re-elected to his seat in the House over independent candidate David Seal with 72% of the vote, and this time with a GOP majority in which he may serve either as Deputy Speaker or Chairman of an important committee. I even decked out my chair for the occasion. 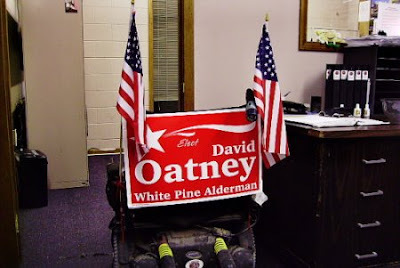 If you saw me campaigning at the school or running around on my way on Election Day, you saw that my power chair was All American with its flags and campaign sign. With lower-than-expected collections in the previous two months as well, general fund collections for the first quarter are about $200 million below what state budgeters anticipated. They had predicted that "these are not the worst three months that we're going to see in this year." General fund revenues pay for the day-to-day operations of government; other funds pay for specific areas of state spending, such as the highway fund. The grim revenue numbers point to a far deeper yearly shortfall for the state, which Bredesen has previously put at $300 million to $600 million. New projections suggest that year-end revenues could be $800 million below projections. That would put the state on pace for a shortfall the magnitude of the state's last recession in 2001 and 2002. Early in the year, the administration had indicated a reluctance to dip into those reserves, which includes the $750 million rainy-day fund, about $500 million in TennCare reserves, and several other reserve accounts. The news arrives amid economic and political uncertainty. On Nov. 4, the governor lost an ally in the House when the GOP gained an unexpected four seats and a slim 50-49 majority, creating new uncertainty about relations between the Democratic governor and the GOP General Assembly. Of course, what The Tennessean and other press outlets which fawn over Phil Bredesen are not reporting is that the Governor was warned that his new taxes on tobacco and other commodities would not increase the size of the State's purse, but would instead likely lead to a decrease in overall revenue-largely because the Honorable Phil Governor couldn't quit spending when he needed to. Because Republicans were the ones doing most of the warning, our collective warnings about where the Governor's policy could lead the State Treasury were cast aside as mere partisan bickering. Now the Republicans are the new Sheriff in town, as it were, up at the Capitol. After endless warnings of what would happen if the Governor actually enacted some of his new, largely uncollectable taxes (readers will recall that Tennessee Revenue Commissioner Reagan "I'm A Lawyer" Farr actually contemplated stationing revenuers at the border to search people's cars for cigarettes in Gestapo-like fashion), the Governor wants to try and pull the wool over everyone's eyes and pretend that everything that is happening to the State Treasury is the fault of the sour economy. 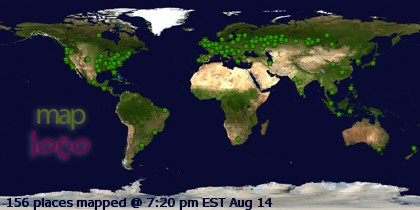 Yes, the economic situation is playing a role in all of this, without question. However, the Honorable Phil Governor is being disingenuous in saying that this was unexpected-some people did expect it, and said that the Governor's tax policy was playing a role in exacerbating the budget crisis. The allegation that Obama was not born an American citizen; lost any hypothetical American citizenship he had as a child; that Obama may not now be an American citizen and even if he is, may hold dual citizenships with other countries. If any, much less all, of these allegations are true, the suit claims, Obama cannot constitutionally serve as president. The allegations that "Obama's grandmother on his father's side, half brother and half sister claim Obama was born in Kenya," the suit states. "Reports reflect Obama's mother went to Kenya during her pregnancy; however, she was prevented from boarding a flight from Kenya to Hawaii at her late stage of pregnancy, which apparently was a normal restriction to avoid births during a flight. Stanley Ann Dunham (Obama) gave birth to Obama in Kenya, after which she flew to Hawaii and registered Obama's birth." The claim could not be verified by WND inquiries to Hawaiian hospitals, since state law bars the hospitals from releasing medical records to the public. I am somewhat hopeful that Berg will successfully appeal Surrick's outrageous decision to 3rd Circuit Court of Appeals and then to the United States Supreme Court if necessary, even if technically he doesn't have standing to hold Obama accountable to the Constitution. Why? Because this is America, and out of 300 million people, someone should give a damn enough about this republic to make sure the person who holds the highest elected office in the land holds it legitimately based on the black letter text of Article II, Section 1 of the U.S. Constitution. Berg said he was told by a clerk for Souter that his application for an injunction to stay the election was denied. But he also said the defendants "are required to respond to the Writ of Certiorari" by Dec. 1. Legally translated, that means that Barack Obama has until December 1st to produce the authentic copy of his birth certificate, not a facimile from a website which cannot be authentically verified. If he cannot do this, it may force the Court to take up the question of Obama's citizenship. My money is on Obama ignoring the High Court and hoping the Court will in turn ignore the issue in the name of keeping the peace-something they may in fact do. If the Court does not ignore the matter, however, we have a massive problem on our hands. The Constitution has for too long been ignored by public figures in both parties in the name of expediency, and this could be a case where our national charter is thrown to the wind by an incoming President before he even swears the oath to support and defend that document. The Court should not ignore the Constitution's clear provisions on the qualifications of a President, it has a duty to enforce them regardless of political consideration or concern over public disorder. Unlike some conservatives, I do not wish for the President-Elect to be dislodged from office on account of discrepancies over his birthplace. He has won a national election of historic import, and if now we learn that he cannot prove his natural-born status and that, as a result, he cannot be allowed to be sworn in as President, this country may begin a period where there is no social peace for many years to come. The Constitution cannot and should not be ignored in the name of order-we've already seen the present administration do that, and the country is worse off for it. Barack Obama can end this speculation and prevent a pall of illegitimacy from hanging over his administration by producing the true and correct copy of his birth certificate for the world and the Supreme Court to see. I urge the President-Elect, not as a Republican, but as an American to end this speculation by producing his authentic birth certificate and presenting that document to the world in a press conference. In doing so, President-Elect Obama can not only maintain legitimacy, but he may help keep the peace as well. Today marks the anniversary of the dedication of the Lateran Basilica (The Cathedral Basilica of Our Lord and Saviour and St. John the Baptist) in Rome. It is celebrated as a feast day throughout the Universal Church, as the Lateran Basilica is the Cathedral church of the Bishop of Rome, and thus is "the Mother Church of Rome and all the World."